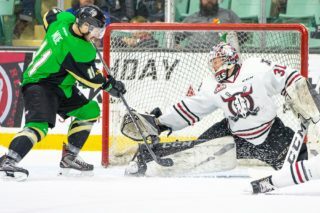 Red Deer Rebels netminder Ethan Anders had a brisk workout Saturday night at the Centrium, but it hardly left him breathless. The second-year stopper will start the lion’s share of games this season and is anticipating the challenge after sharing duties with Riley Lamb last winter. If his performance Saturday was any indication, Anders will give the Rebels a chance to be successful most nights in the upcoming season. Despite appearing in his first exhibition game this fall, he looked close to mid-season form. 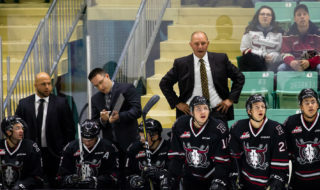 Rebels GM/head coach Brent Sutter felt Anders was “outstanding” but otherwise didn’t throw out a lot of accolades in regards to his team’s showing. 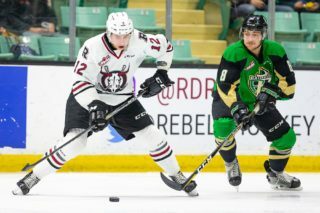 The setback in the final contest of the Rebels’ four-game preseason tournament evened Red Deer’s exhibition record at 1-1. “I thought it was a sloppy game on our part,” said Sutter. “I thought we lost too many battles, we weren’t quick to pucks. I know some guys didn’t play last night and this was their first game, but the guys who played last night, I didn’t like much about their game at all. The teams were tied 1-1 after one period, with Calgary’s Riley Fiddler-Schultz scoring on a wrap-around and defenceman Alex Alexeyev replying with a rising wrister from the high slot during a Red Deer power play. Mark Kastelic restored the visitors’ lead at 8:26 of the second period, winning the puck along the boards, moving into the low slot and beating Anders through the pads. That lead stood up until the final minute when Alexeyev directed the puck at the net with the Rebels on the power play and Anders on the bench, and Chris Douglas redirected it past Hitmen netminder Nick Sanders to force overtime. Sanders denied Rebels forward Brandon Hagel on a breakaway early in the five-minute, three-on-three extra frame and seconds later Zach Huber scored for Calgary on a two-on-one break. Sutter liked the work of the Douglas-Oleg Zaytsev-Hagel line and was impressed with Alexeyev “once he settled in”, however . . .
“Some guys that we expect more from have to do more for us,” he added. “You have to understand that once you get to this level there has to be a high level of compete. “The players who were here as 16-year-olds last year have to be better for us. I don’t think their level of play is where it needs to be right now, either. 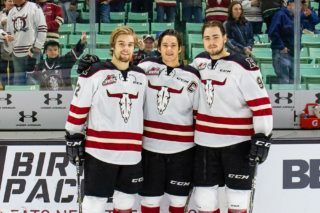 Matthew Armitage started in the Hitmen net and stopped 13 of 14 shots before being replaced by Sanders, who blocked 12 of 13. Red Deer was two-for-seven with a man advantage; the Hitmen zero-for-three. The Rebels return to preseason action next Saturday against the Lethbridge Hurricanes at Wainwright. 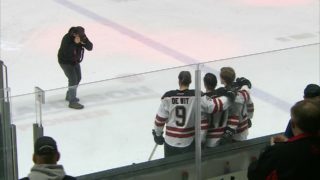 Red Deer will then take on the Edmonton Oil Kings Sept. 14 at St. Albert and will close out their exhibition schedule the following night at the Centrium versus the Medicine Hat Tigers. ° In the afternoon contest, the Oil Kings got goals from Liam Keller, Jaylen Luypen, Ty Gerla and Andrei Pavlenko in a 4-2 win over the Kootenay Ice. Holden Kodak and Brad Ginnell scored for Kootenay, which was zero-for-five on the power play. Edmonton starting netminder Todd Scott stopped 11 of the 12 shots he faced, while Boston Bilous turned aside nine of 10. For the Ice, Jesse Makaj made 13 saves on 15 shots and Alexander Gage blocked 15 of 17 in a relief role. The Oil Kings were zero-for-three on the power play. Calgary was 2-0 in the tournament, with Red Deer and Edmonton 1-1 and Kootenay 0-2.